Blog Home > Seasonal > The Best Use of DIY Skills Ever! The Best Use of DIY Skills Ever! Who hasn’t played in a cardboard box at some point in their lives, and small children always seem to be more interested in the packaging and wrapping than the presents don’t they? We thought they might have a point, so with Christmas coming we have been sifting through the web to bring you some of our favourite uses for cardboard. This first idea ticks the boxes of keeping the kids amused and encouraging imaginative play with these fantastic helmets from Crafteeo.com who sell all the templates and materials to make cardboard armour. The company was set up by a dad who wanted to engage with his son in some hands on play. This is his solution to encourage him to make things together and invent games to play, rather than relying on video games for entertainment. There is even a back-story on the site, with heroes, heroines and Dragons in order to kick-start your children’s imagination, but I am sure once they get their hands on this cardboard armour they will soon be making up their own tales of adventure. You might need a glue gun for these great projects – like this one, which is available online from our DIY Superstore. Glue guns are a really fast and secure way to fix cardboard items together, but make sure it’s the adult who is using it as they get very hot. The Finnish Government issues a maternity box to all expectant mothers who want them. The box is full of basic essentials for the first few moths of the baby’s life including clothes, a sleeping bag, outdoor snow wear, and nappies as well as bathing products for the baby, with bedding and a small mattress supplied to turn the box into a bed. Well why not? It is a sustainable warm, cozy and hygienic environment for the newborn. I am sure that with a few DIY skills the cardboard cots are turned into fantastic havens for their tiny occupants, and with the Nordic sense of style coming to the fore I bet they have many stylish interpretations too. The box has helped to promote good standards of healthcare and significantly lower infant mortality in Finland, read the full story on the BBC website. Yes really! This model the ‘Alpha’ is the third prototype created by the inventor, Israeli-based engineer Izhar Gafni, who claims that the bike can be produced for just £10 per unit. He got the idea having read about a man who built a canoe out of cardboard. As the bike is covered in waterproof resin it is sturdy and waterproof. It will resist the elements and humidity and being so cheap to produce could make it a hit in third-world countries. He has secured backing a company called ERB who obviously see the potential in his great cardboard invention. This amazing expanding furniture is a great way to add extra seating when you are having people over, great for parties say, around Christmas. The FlexibleLove chair can be used as a chair for one or sixteen! We first saw it at a trade showand we can report it is surprisingly stable and fairly comfortable, certainly no less comfortable than digging out all those folding chairs from the village hall or deck chairs from the shed. The ‘chair’ can be twisted and turned into many formations, and it makes a great talking point as people come in, and the furniture just gets bigger and bigger. You can read more, see more photos and watch the video on Gizmag here. Instructables have provided the guide to building your own cardboard furniture and we can provide the materials and tools you need to do the job – brilliant! See the step by step guide to making your own bedside table, you can adapt this to make any small pieces of furniture. You will have to be careful that any furniture you make can bear the load you intend to place on it. So be really careful if you are making something that a person might sit on for example. Get your cut edges really straight using a decent aluminium ruler – this 600mm one is less than £2 and there are loads more in our online store including metre rules. See the full range of spring clamps in our DIY Superstore, we also stock ratchet clamps and G Clamps. Well it is something to put on Your Christmas list, especially if you are going to do a lot of modelling or cardboard furniture making. Otherwise, you can use a nice sharp knife, like one of these fixed blade knives from our online store. Don’t forget the glue, use PVA or similar to get a good long lasting effect. Finally finish off your project by applying the paint or finish of your choice. 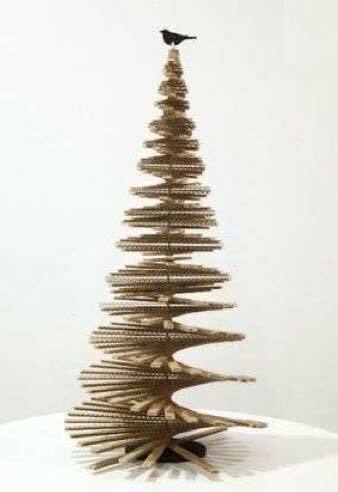 How could we start off talking about Christmas and not end by bringing you an image of a cardboard Christmas Tree? Find out more about PVA in our Projects section.